You can also climb the tower for superb views over the surrounding countryside, though I confess I never did. The church bells are famous too and the carillon plays a tune at 8am, noon, 4pm and 8pm with a different tune each day. A memorial plaque to A E Housman, famous for his poems ‘A Shropshire Lad’ can be found on the North wall near where his ashes are buried and a cherry tree has been planted in his memory. Housman in fact is not a Shropshire lad, but came from Bromsgrove in Worcestershire. A narrow house opposite the churchyard is the Reader’s House, a late medieval stone building with the timber framed porch added in 1616. The detailed carving of the woodwork is typical of early 17th century Ludlow carpentry. 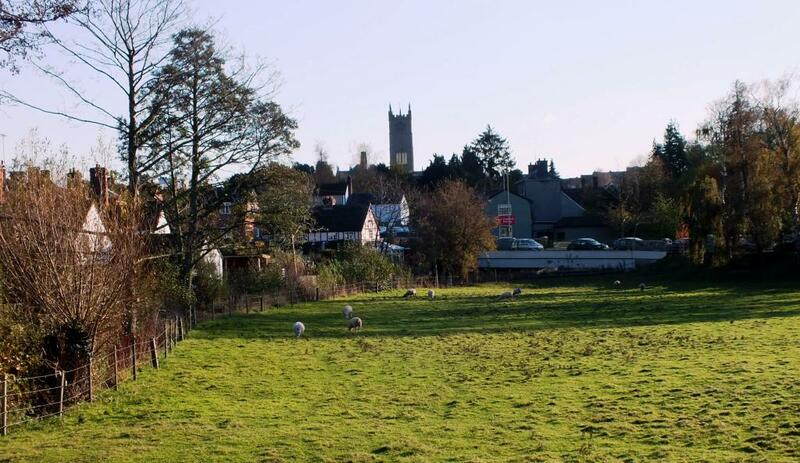 We’ll stop briefly and have a look at the views towards the South Shropshire Hills from the church green before continuing through the town walls and the site of one of seven original gates – Linney Gate – which overlooks the Linney – a damp riverside area probably used for the growing of flax in early medieval times. Continue down Upper Linney, a narrow cobbled lane which has what looks like old rail/cart tracks running down the hill, with very small houses huggled together on either side; the ones on your left squeezed against the old town wall. Given there is a building which was used to manufacture nails (Cooper and Bluck’s Nail Manufactory 1854) I am guessing there was some light industry carried out along here, but I haven’t actually been able to find out much about the area. Nowadays most of these houses appear to be holiday lets. If you turn left at the bottom of the Linney and follow the road beneath the foot of Ludlow Castle ramparts you will reach Mr Underhills² a former Michelin starred restaurant ‘with rooms’ on the banks of the River Teme. Close by is Dinham Bridge which we went across on the River Walk. We however are going to turn right and head down the steps to follow the Linney as far as the corner with the farm on your left guarded by two large stone lions. Walk straight ahead through a kissing gate and over a small bridge crossing the River Corve. This section over the Corve Meadow may be very muddy after rain. Look back here for a glimpse of the castle behind you. Sometimes you might find cattle in this meadow, but they seem to be quite docile. On reaching the main road we’ll turn left and then cross over onto Bromfield Road to make our way back into town. After crossing the road bridge alongside the pasture field turn right into Lower Corve Street where there are several interesting timber-framed buildings including the Unicorn public house where we can stop for lunch or a drink. 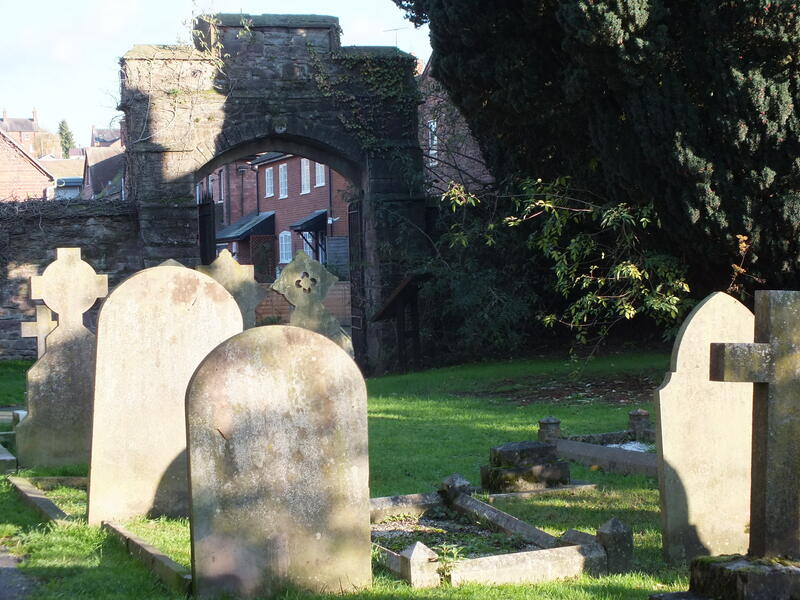 This area was the centre of Ludlow’s dyeing and tanning industries from the medieval period until the 19th century. 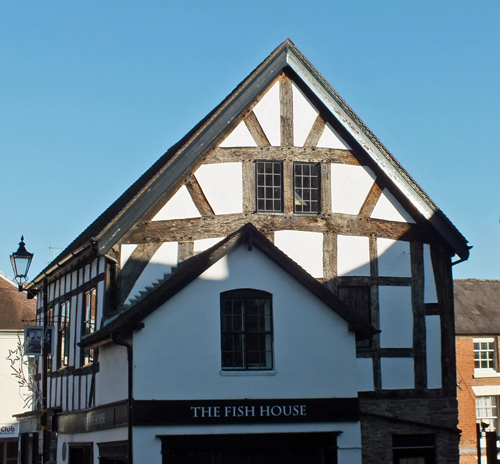 Here you will find the Merchant House which was occupied by a succession of dyers, woollen cloth being the source of Ludlow’s prosperity during the Middle Ages. It is now a popular bed and breakfast establishment. 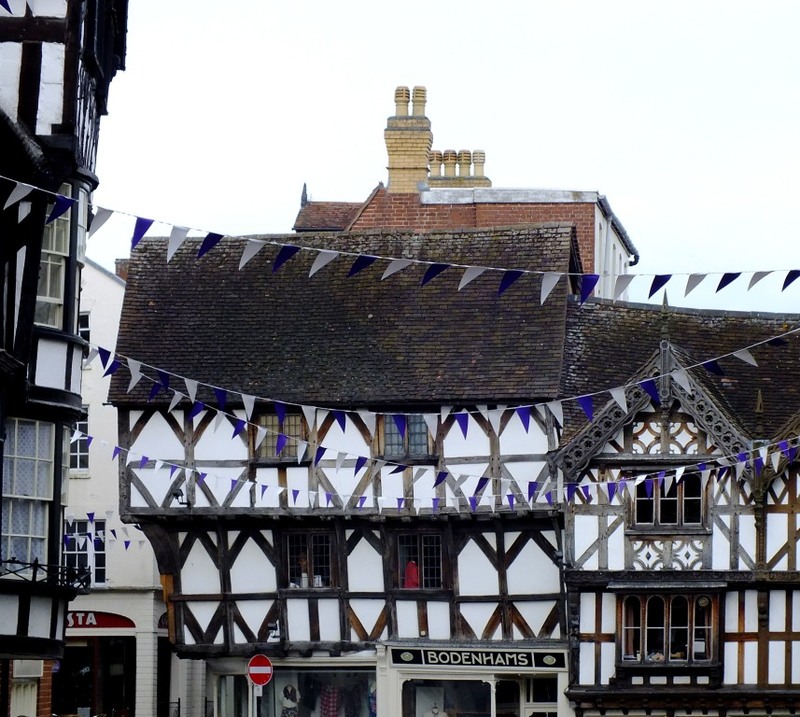 Glove making was another major industry in Ludlow during the early part of the 19th century and opposite the Unicorn you will see the lilac coloured Glover House which has light airy rooms, high ceilings and unusually large windows providing more light for the glove workers. Now it is a fine town house. At the end of Lower Corve Street you pass an impressive yellow painted timber framed house. And now we continue up Corve Street, which is quite a steep climb, so deep breath! 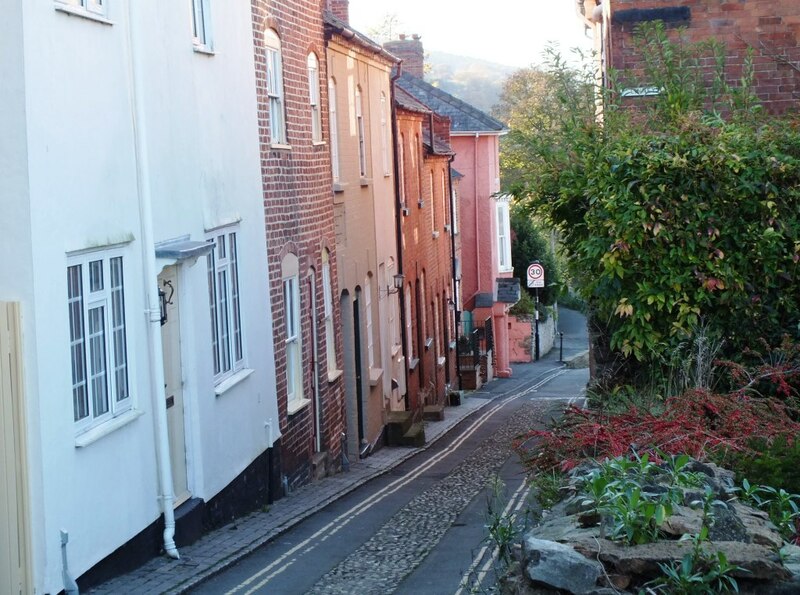 Corve Street is a wide ancient road running North to South and the logical route over the hill (the ‘low’ or tumulus) to the ford crossing the river Teme (the ‘Lud’ or loud waters). It marks the Eastern boundary of the Norman town and was burgaged³ all down its length. After the leather trades Corve Street was the centre for malting as evidenced by the Ludlow Brewery on your left. On your right is the St Leonard’s burial ground which is a lovely spot for a breather and for some interesting facts, not least that the site has a history going back to the 14th century when in 1349 Laurence de Ludelow founded a Carmelite friary that remained until its dissolution in 1538 by Henry VIII. 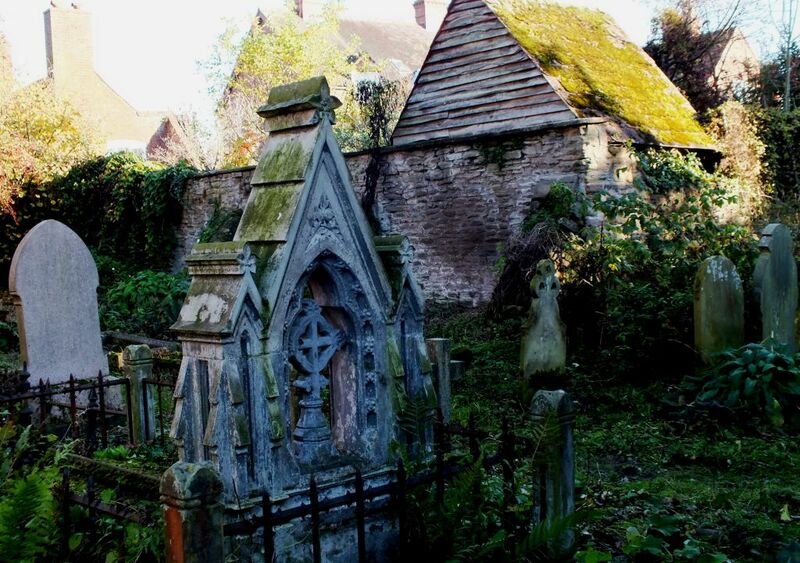 The churchyard is now designated as a wildlife reserve and is a peaceful ‘people place’ as well as a sanctuary. The listed gateway has an inscription which commemorates the gift to the parish of the burial ground by the Clive family 1824. There are five listed war graves in the churchyard, all of which are now accessible to view. There are many independent shops along Corve Street, which are one of the attractions of this small town. Towards the top of the street where another of the main gates would have been is the world-famous timber façade of the Feathers Hotel built during the reign of James I. The ostrich feather motifs can still be seen on the collars of the three street gables, although now weathered over the centuries. It only became an inn in 1670. Opposite is the Bull Inn, a Georgian coaching inn, though behind the building are parts dating back to 1350. The Bull and the Feathers hold an annual traditional tug-of-war competition on Boxing Day. Don’t miss other interesting buildings along here such as the HSBC building (a rather good example of Mock Tudor) and Emporos a lovely toy and gift shop (with a nice little tea-room to be found down Attorney’s Walk too). Now we are at the top of the hill, pause for breath before we head into the Bull Ring which was a Beast Market in the 17th century and used for cattle sales rather than bull-baiting. Here you find the Tolsey which was built in 1420 as a medieval toll-booth with a court room over an open ground floor. Tolls were collected on the ground floor for the market. It was the seat of the Court, also known as Piepowder (from the French pieds poudrés meaning dusty feet – the dusty feet of travellers and vagabonds who would visit the market) for instant fines. Trials at these courts were short and informal – punishments typically included fines, being held in a pillory or being drawn in a Tumbrel to humiliate the offender. Today it houses a fine fishmonger where you can buy fresh fish and shellfish as well as sit down to a pleasant tasting experience complete with a glass of fine white or rosé wine. And appropriately there is still a solicitor’s office on the upper floor. Heading back towards Castle Square and the market is King Street, a narrow lane with a double row of buildings facing back to back – one facing King Street, the other south on to Pepper Lane. This is the original Southern limit of the market area. 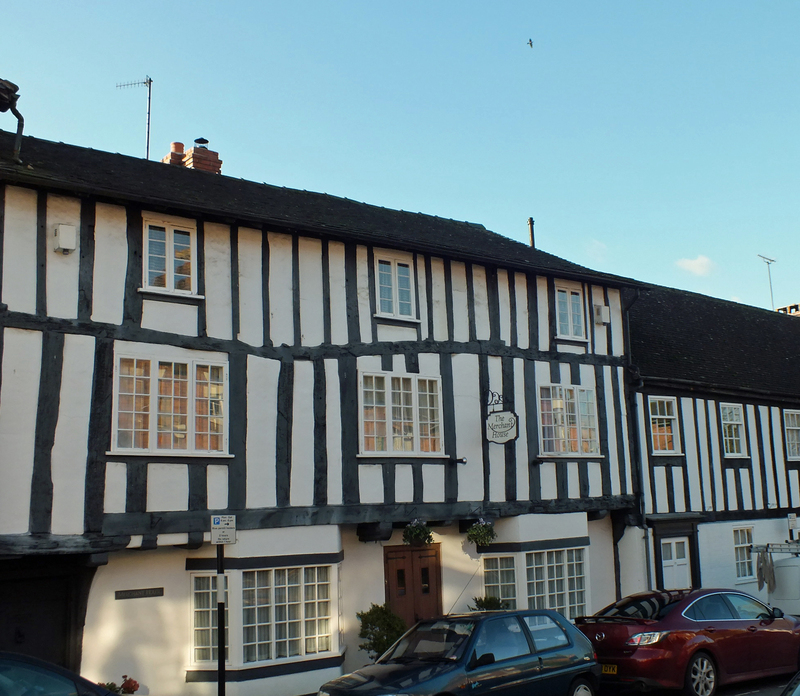 Again there are some interesting timber framed buildings along here, some with deep jetties supporting the upper floors. 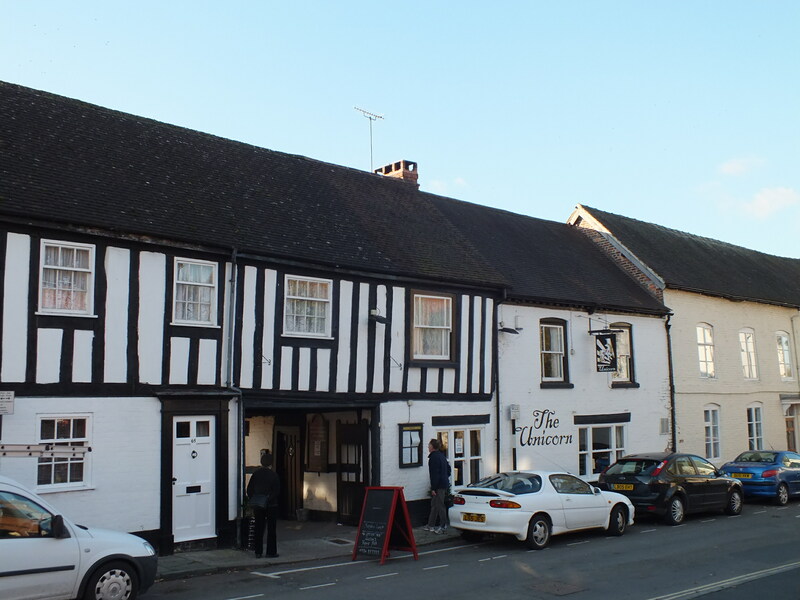 Ye Olde Bullring Tavern has its roots in the 14th century though the current building dates from the 17th century. Take care not to walk into the road here as the pavement can be quite crowded and traffic can be busy. There have been plenty of times where I have had to brake hard to avoid a pedestrian. Now we have arrived at the Buttercross, an 18th century covered market with its clock tower, you can take one of the three parallel cross streets that lead back into the square, or head to a tearoom for a piece of cake and a cuppa as I don’t know about you, but I’m totally exhausted now! For my other walk in Ludlow, around the River Teme, please click here. ¹Please note that restaurants and shops may have changed names / ownership / or even closed down since this was written so always check if there is somewhere you want to visit. ²It was the town’s last remaining Michelin star holding eatery when the owners Chris and Judy Bradley closed its doors for the last time in December 2015. It’s a bonny town, isn’t it? Thanks for all the history, and that lovely carved stone head. Thank you on Mick’s behalf for all the pies, and did I notice a bit of canoodling going on at that kissing gate? 🙂 🙂 Happy Sunday, Jude! A bony town indeed, Jo! This is an amalgamation of several old posts that didn’t attract much attention at the time. So you have probably walked this route with me before. Still miss the old place, but you can’t always have everything. What s great post and what a great place Ludlow is. Every time I go there I always have a good feeling about the town. Thank you. I miss the place – can’t beat it for the market and the wonderful independent shops. oh wow now this is a town stroll . . not sure I’d manage it without cake at the start, middle and end!! Well there are plenty of places along this route to fulfil your wish! I enjoyed the stroll – you picked out some wonderful highlights. It is a stroll I did many, many times. 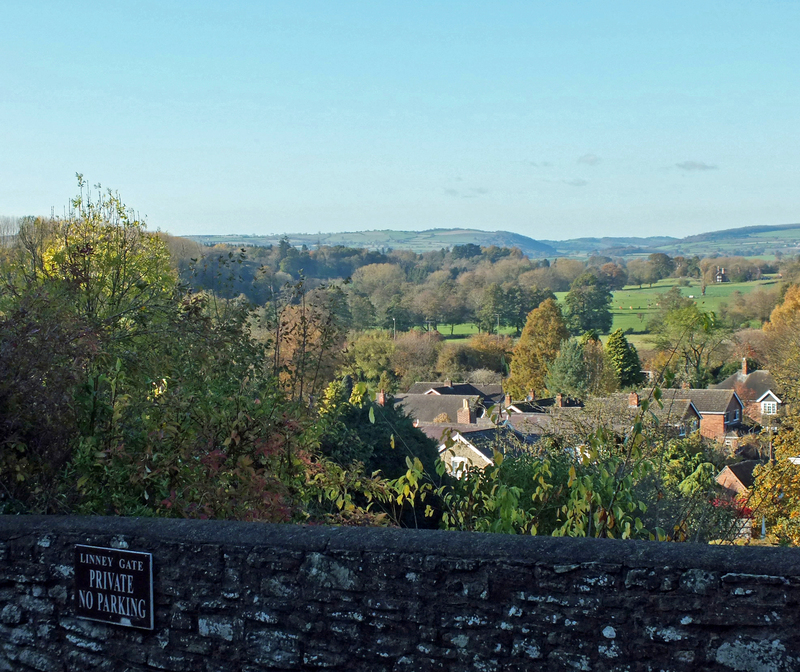 I don’t think there is much in Ludlow that I haven’t photographed, except the outskirts. Thanks for my Virtual wander, Jude, much appreciated. 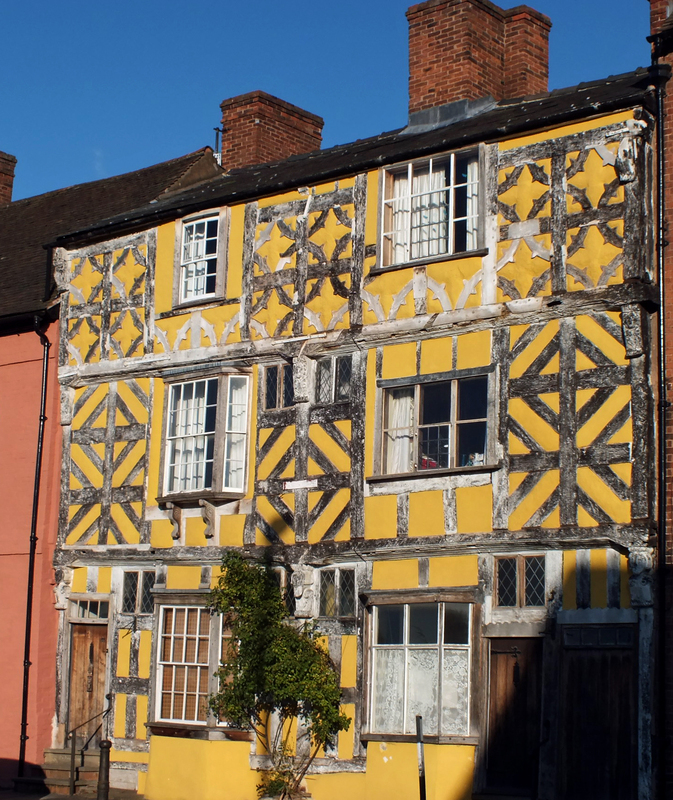 Love that yellow painted timber house….in fact, Ludlow is full of architectural gems! It certainly is. If I could have moved it closer to the sea it would have been an almost perfect place to live in. The sea, the sea….have you always felt the pull of the sea, Jude? Only really since I lived by it in Cape Town. I just fell in love with the openness of being by the sea. I am not even a beach person, as in lying on a beach, but love to watch the waves. Even here I feel too far away as I can’t walk to the coast. Where did your mother live? Axminster, so we used to go to Seaton, Sidmouth, Lyme Regis…. Ah, a lovely area. I like Lyme Regis very much. Much too busy! But it is where you are…. Anywhere along the coast is busy, except parts of Wales, Scotland and Northumberland. Not sure I could cope with the cold up north now though. Reminds me of Shrewsbury a bit, love the yellow house, nice shots and info. A much nicer place than Shrewsbury, compact and with a fabulous market most days of the week. A fine tour, Jude. You showed me some new things too. Will look out for mermaids next time we go. I am tempted to come to take that stroll once. I haven’t heard of the town. Reminds me of York or Chester. Thank you for showing us these beautiful photos. What a beautiful town – I do remember some of your previous walks there so it was nice to revisit. Thank you for this lovely tour, Jude. It is quite beautiful with much to grab one’s attention and interest. I can easily imagine you wandering and exploring here. It seems like there are many good food options too. Ah, yes, Ludlow is quite a foodie town. Once home to a couple of Michelin star chefs, but alas no longer. There is an annual food festival though that is extremely popular. What a pretty and historic town Jude, just my kind of place. Thank you for Mis Mermaid, she’s a delight!